The picture of the brightly colored dress prompts excited back-and-forth conversation. The woman who shared the image wants to look her best at an upcoming family bar mitzvah, but she wants to know if the pink is too garish. Happy to weigh in, her friends and acquaintances regale her with a cacophony of opinions: It needs a good seamstress and It’s perfect—and why focus so much on clothing, you’ll look beautiful no matter what! At a separate gathering, a number of women are reacting angrily to an uncomfortable incident at a craft store in Florida. Recently, one of them had gone in looking for holiday paraphernalia and was aghast that a salesperson told her they no longer carry many Hanukkah items because they don’t want to offend anyone in the current political climate. Is this an anti-Semitic company policy, or the hateful actions of a lone employee? one asks. Others call for a boycott of the store. At yet another space, a group is debating the perceived “goyishness” of green bean casserole. Most in the conversation agree that the American holiday dish, though delicious with crispy onions, is in fact not particularly Jewish. A few note some Jewish takes on the casserole—and then the conversation veers into a debate on the appropriateness of the term “goyish” altogether. The venue of choice for all of these discussions—and many, many more—is Jewish Facebook groups, focused pages on the social media giant where members can post an image, question or article for discussion as well as comment on others’ posts. 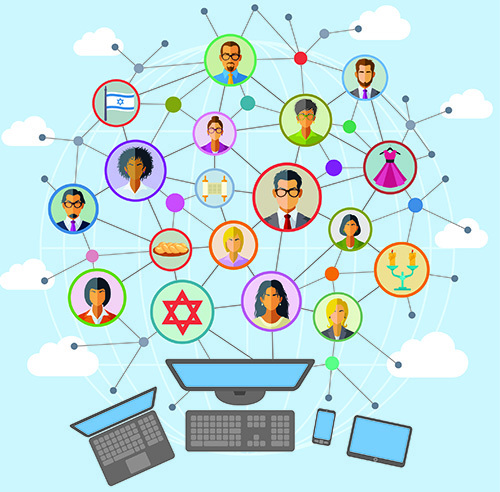 While Jewish conversations take place across digital platforms—on Twitter, WhatsApp and Tumblr, to name a few—many Jews look to Facebook groups in particular for community as well as for a way to connect with others outside their immediate religious and geographic environment. Indeed, the past few years have seen an explosion of these Jewish-focused Facebook gatherings, colloquially known as “Jewbook.” There are well over 1,000 groups with “Jewish” or “Jews” in their names, and these are just a fraction of the others that don’t specify “Jewish” in their title. Most of them are “public,” in Facebook parlance, and can be joined with the click of a mouse; some are “closed,” requiring admission by an administrator or an invitation from a member. A smaller number are “secret”—meaning they are not publicly visible and only current members can add new ones. Both closed and secret groups are considered private, and posts or comments cannot be shared without permission. Some of the largest associations have memberships in the tens of thousands, and average over a dozen new discussions per day. Posts on Jewish Women Talk About Anything, one of the most popular, can receive several hundred comments each. The forum, true to its name, hosts topics ranging from the mundane to the deeply personal. Another well-frequented group, God Save Us From Your Opinion: A Place for Serious Discussion of Judaism, is a space to debate the finer points of halacha, identity and practice. I Don’t Cook But I Give Out Recipes, while not explicitly Jewish, includes over 40,000 mostly Jewish recipe-swappers and is one of the dozens of food-related Facebook groups. Many groups in the Jewish Facebook universe cater to niche interests. Educators have JEDLAB; observant female pop culture enthusiasts meet up on Orthodox Ladies United in Fandom. There is even a space for pet lovers—Jewish Pet Owners Unite. “Everyone wants to feel like they’re part of some like-minded community,” says Chedva Tennenberg, a 47-year-old modern Orthodox woman who belongs to around 20 Facebook groups—though she is not active in all of them—including some for olim that she joined when she moved from New Jersey to Israel with her family in 2015. Esther Lejbovitz, creator of Jewish Women Talk About Anything. At the same time, it is the range of backgrounds and perspectives in larger groups like Jewish Women Talk About Anything or God Save Us From Your Opinion that is part of their appeal. “I’ve found it fascinating learning about all the different levels of observance in the group and the life experiences of Jewish women worldwide,” says 53-year-old Sharon Lubin, a Conservative/Masorti member of Jewish Women Talk About Anything who lives in London. 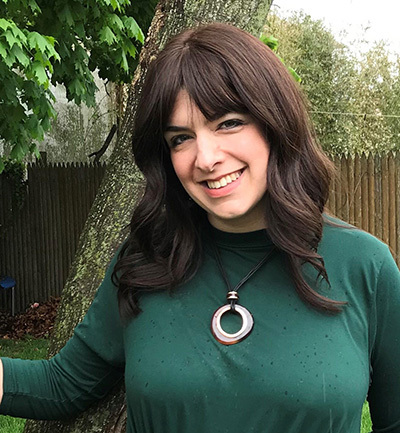 About 60 percent of members of Jewish Women Talk About Anything are Orthodox, though with “a very, very wide range” of beliefs and practices, notes creator Esther Lejbovitz, 37, from Far Rockaway, N.Y., who is Orthodox herself. The rest, she adds, are affiliated with other denominations, and a small minority are secular. Others find the groups indispensable for both emotional and practical support. Although Tennenberg feels relatively settled in her Jerusalem home, she looks to Living Financially Smarter in Israel and Restaurant Club Jerusalem as well as other spaces for English-speaking immigrants for advice—from the best school for her kids to the difference between shamenet and shamenet lebishul, sour cream and heavy cream. For some people, online communities can feel welcoming in a way that local ones don’t. “Lots of people tell us they haven’t found a synagogue they like, or that they’ve been turned off by traditional Judaism,” says Mark Oppenheimer, 44, who started an eponymous group in 2017 for fans of Unorthodox, the podcast from the online magazine Tablet that he co-hosts. To get a sense of this dissatisfaction, consult Jewbook itself. Recurring posts on God Save Us From Your Opinion, which launched in 2014, center on the ways synagogues treat, and sometimes mistreat, individuals. For example, one post asks how shuls should behave toward those who refuse to become members, either because of ideological or economic reasons. Another questions the appropriateness of bringing a service dog to synagogue. The heated conversation threads that follow these kinds of posts often extend into other issues, such as the high cost of synagogue dues, inaccessibility of some Jewish institutions for people with special needs and racism within Jewish communities. Despite the sense of community, some discussions that touch on politics, gender or sexual issues—contentious topics outside Facebook, too—can become divisive, even nasty. Lejbovitz, who created Jewish Women Talk About Anything in 2014 and acts as one of its moderators, finds that political posts, whether about Israel or the United States, can be particularly difficult. “When people start saying in connection with a post ‘You’re a soulless woman,’ or ‘How can you call yourself a Jew?’ that’s when it has to stop,” she says. 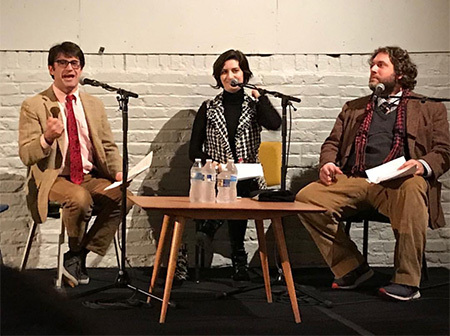 (from left) Mark Oppenheimer, Stephanie Butnick and Liel Leibovitz of the Unorthodox podcast and group. Jewish Women Talk About Anything has developed a band of nine moderators who vary in levels of observance and political perspectives to ensure that decisions are fair, says Lejbovitz. A woman of color recently began moderating as well. Overall, however, the positives of these groups far outweigh any negatives, their creators say, both online and IRL. In the aftermath of the shooting at the Tree of Life synagogue in Pittsburgh in October, for example, many people took to Jewish Facebook groups to share links to charity drives for the synagogue and the victims’ families as well as to express sorrow and solidarity. Jennifer Richler is a freelance writer living in Bloomington, Ind. Very informative, I spend a lot of time on Facebook, and have made up some closed groups of groups of neighbors, family and synagogue members (one from a synagogue that had disbanded so we can keep in touch.) The Jewish Women talk about Anything, and God save us from your opinion sound more like conversational places and may check them out.